Health care reform, an issue that has long simmered on the media back burner, finally exploded into the headlines last week, accounting for one-quarter of the overall coverage. Yet late in the week, the health care debate took a back seat to the arrest of a black professor that exposed the “third rail” of American society—race. Together, the two stories accounted for nearly 40% of the coverage from July 20-26. And in both cases, Barack Obama played a key role. The debate over health care legislation filled 25% of the newshole last week and was the top story in four of the five media sectors, according to the Pew Research Center’s Project for Excellence in Journalism. That marked the most weekly attention to that subject since PEJ began the News Coverage Index in 2007, more than doubling the previous high water mark (11%), which occurred the week of July 13-19, 2009. 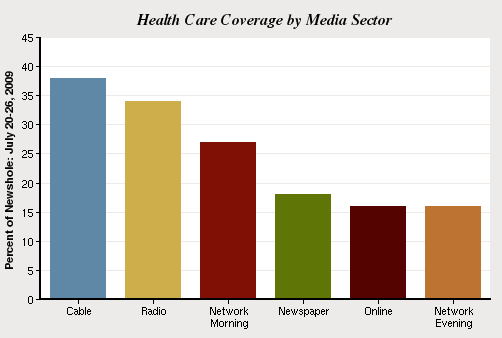 Indeed, coverage of the health care issue has traditionally ranged from sparse to non-existent. 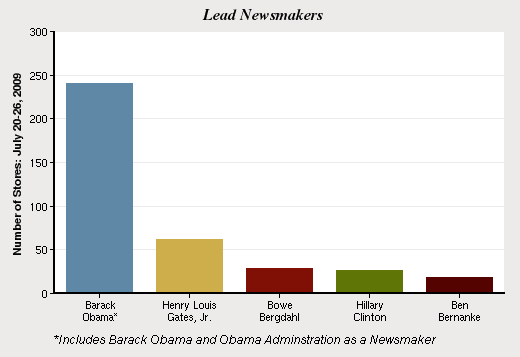 In 2007 and 2008, it accounted for less than 1% of the overall newshole. But the subject has generated more media scrutiny in recent weeks as it moved squarely into the political arena. Last week, as Obama convened a press conference and his timetable for legislation seemed to be slipping, coverage spiked dramatically—evidence of the media’s proclivity to pay more attention when complex issues are framed by a heated Washington debate. Another story that emerged to dominate coverage late in the week was fueled by an Obama remark during his July 22 press conference on health care. The July 16 arrest of prominent black scholar Henry Louis Gates in his Cambridge home by a policeman investigating a break-in had already generated attention in the media. But it became a supercharged story when the president, in response to a reporter’s question, declared that he didn’t know “not having been there and not seeing all the facts, what role race played in that,” but that the police had “acted stupidly” in the case. In an instant, the arrest was not simply a story about the racial climate. It also injected Obama directly into a politically charged controversy at the dangerous intersection of law enforcement and civil rights. The Gates case was the No. 3 story at 12%, just behind the economy. But it built momentum over time and was the top story in the second half of the week, filling 25% of the newshole from July 23-26. The second-biggest story last week was the economic crisis, which also filled 12% of the newshole—very much in keeping with the level of attention (13%) it has attracted for the past three months. The fourth-biggest story (4%) was the conflict in Afghanistan, with much of the narrative focused on the plight of a U.S. soldier captured by the Taliban. The fifth-biggest story (also 4%) was the 40-year anniversary of the Apollo 11 mission that put a man on the moon. Much of the coverage seemed to reflect nostalgia for a bygone era when space exploration was both a national priority and a source of collective pride. One sign that health care has become a more polarizing and political issue can be seen in last week’s coverage patterns. The two media sectors that include the ideological and debate-oriented talk shows devoted the most attention to the story—38% on cable news and 35% on radio. In addition, a PEJ examination of storylines in last week’s coverage indicates that the horse race aspect of health care reform—the politics and strategy behind the legislative fight—was the overwhelmingly dominant theme. A good chunk of the coverage, particularly in the talk-oriented media, portrayed the health care battle as a philosophical donnybrook between the forces of big government and big business. The July 22 press conference quickly spawned coverage and commentary that often played out along sharply drawn political lines. Explaining the complicated state of health care coverage, as well as the details of various ideas to reform it, can be a very daunting task for the media. Monitoring the spin wars between the two sides is far easier and helps explain why the subject has finally climbed to the top of the news agenda. The two sectors that devoted the most coverage to the flap over the arrest of “Skip” Gates were cable news (19%) and network news (15%). And perhaps that’s fitting for a story that owes much of its prominence to a televised press conference. The Cambridge police responded with a staunch defense of the officer in question, Sgt. James Crowley, with calls arising for the President to apologize to the law enforcement community. But much of the narrative pivoted to focus on Obama’s remarks and their political consequences. By week’s end, Obama amended his earlier remarks in an attempt to douse the raging controversy. “This has been ratcheting up, and I obviously helped to contribute ratcheting it up," he acknowledged in a statement. "I want to make clear that in my choice of words, I think I unfortunately gave an impression that I was maligning the Cambridge Police Department or Sgt. Crowley specifically. And I could’ve calibrated those words differently." If the administration had hoped to keep health care reform at the forefront of the national conversation, it was Gates-gate that was commanding the headlines at the end of the week. The second-biggest story from July 20-26 was the economic crisis, which at 12% of the newshole, was slightly down from 13% the previous week. (Once again, that subject was the lead story in the newspaper sector, accounting for 20% of the front-page coverage.) The top two storylines were the financial sector and the impact of the crisis on state and local governments. The big news in the banking world was a report projecting the government bailout could potentially cost as much as $24 trillion. Coverage of how states were handling the crisis included a video of California Gov. Arnold Schwarzenegger brandishing a knife as a symbol of budget cuts. The No. 4 story last week was the fighting in Afghanistan, with much of the focus on Bowe Bergdahl, the captured U.S. soldier who was displayed and featured in a Taliban video. The anniversary of Apollo 11 came next at 4%. The almost wistful tone of the coverage was captured in this July 21 story in the San Jose Mercury News. After a series of weeks in which he was supplanted as a top newsmaker by Supreme Court nominee Sonia Sotomayor and pop icon Michael Jackson, Barack Obama re-emerged in the headlines last week. As the figure at the center of both the health care and Gates controversies, he was a lead newsmaker in 18% of the stories from July 20-26. For his part, Gates was the week’s No. 2 newsmaker at 5%. Next (at 2%) came captured U.S. soldier Bowe Bergdahl, followed by Secretary of State Hillary Clinton (also 2%), who traded unflattering remarks with the government of North Korea. The fifth-biggest newsmaker, at 1% was Federal Reserve Chairman Ben Bernanke, who testified before Congress about the administration’s plans to reform the financial sector.